I think most of us are pretty connected to the idea that a full life includes creativity. We’re meant to draw, paint, sing, dance, and tell stories. Virtually all little kids do these things. And then we “grow out” of them. And that’s sad. I spend tons of time with creative people. I also spend time with people who feel they aren’t creative — but they want to be. And I’ve made some observations about why it’s so hard for us to put creative time into our lives. Unfortunately, our pragmatic, ruthlessly productive culture tells us that being creative is only for specialists. Common sense would tell us that of course we can be any of those simply by doing. We can draw, play music, and write, and then we will be artists, musicians, and writers. Creative work feels like something we’re supposed to watch someone else do. We watch cooking shows rather than cook. We watch sports rather than play. If you have any kids in your life, you’ve probably noticed how often they watch someone else play a video game on YouTube, rather than play it themselves. We’ve become a culture of spectators. And it takes real effort to break free from that. Maybe you’ve noticed this whole internet thing. Maybe you’ve noticed how absurdly distracting it is. Maybe you’re reading this post right now while you put off pursuing some big juicy goal, like training to climb Everest or writing your novel, or just dancing around the living room flinging scarves like Isadora Duncan. Just like easy access to “junk food” makes it all too easy to live mainly on sweets, fat, and starch, our easy access to “junk amusement” makes it painfully easy to lose our free hours on mindless diversions. And when I say “We,” I don’t mean, “All those other people.” My phone has started telling me how much time I spend every week using it to play Sudoku. I was enjoying being in denial about that. I’m not some anti-digital extremist who thinks we need to give up every online game and distraction. But just like sweets and starch and fat, we want to keep them in balance with more nourishing things. One reason we chase those distractions is that we really do have a lot of obligations. We have families and jobs and living spaces to maintain. We have friends who need an ear and pets who would like more of our attention. For many of us, making a living is stressful, and paying the bills is a constant drain on our attention and energy. Not to mention the daily struggle to get enough sleep and exercise. There are so many things we should be doing. And things we truly do have to do. Making time for creative work just gets pushed to the bottom of the list. No matter how motivated we are. 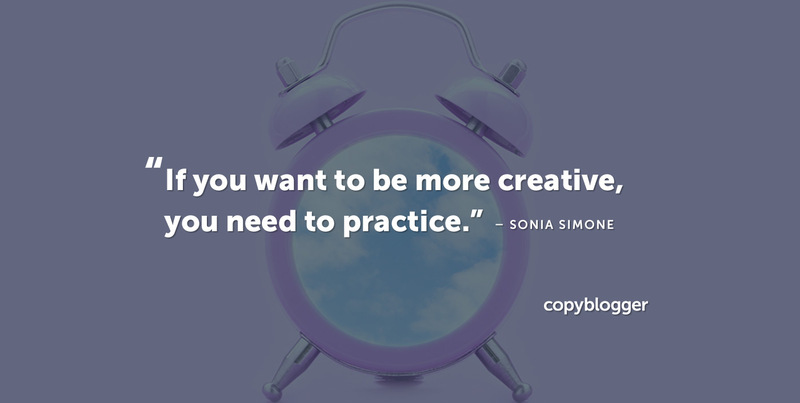 If you want to be more creative, you need to figure out how to get the practice in. Focus on straightforward, well-defined daily assignments, to avoid intimidation and get the practice in. Choose exercises that are fun and interesting, to make it more enjoyable to get the practice in. And get connected to an accountability group … so you get the practice in. A few years ago, I started drawing and sketching for the first time since I was a teenager. And that experience showed me a way I could teach writing and creativity to move folks through the intimidation phase, and to make more time in their lives for creative work (and play). If you’d like to make more time for your own creativity, I’m going to be leading a workshop on how to use a physical notebook — like the THINKERS Notebook — to develop, flesh out, and refine creative ideas. This session walks you through the Portable Writer’s Studio™, a format I’ve developed for keeping a creative journal. It’s based on how artists use their sketchbooks, and it’s designed to help strengthen your creative muscles. I’ll show you how to keep your creative practice fresh, what kinds of things can go into your journal, and how to get past the overwhelm factor. And we’ll work with a few exercises that are fun and interesting enough that the assignments are easy to fit in, even with all of the distractions and obligations that want our attention. These are simple exercises that you can begin to do every day — and your writing will start to get stronger. We’ll also have the chance to get together inside the Copyblogger Slack channel to work through creative blocks and create regular creative habits. The THINKERS Notebook makes a perfect “sketchbook” for writers and creative thinkers. And if you order a couple (or more) using the link on this page, you’ll get access to my Portable Writer’s Studio workshop for free. Dee, our ultra-friendly support person, will add your name to the invite list for the private workshop. We haven’t set a date yet, but it will be scheduled closer to the ship date for the THINKERS Kickstarter. We’ll be recording it, in case the date or time aren’t convenient for you. Dee will also send you an invitation to our Copyblogger Slack group. You can join that right away, and connect with me there, if you like, with your questions, concerns, or stuck spots around your own creative output and habits. You need to use our link to buy your notebooks — it’s an affiliate link, meaning we get a few dollars in commission, which helps cover the costs of the workshop. You need to pledge at the $50 or higher level. That level currently gets you two notebooks (there are about 220 left at that tier, after which it’s an additional $5 for the pair). We need to receive your receipt by Monday, March 11, 2019 in order to send you your free invitation to the workshop. If you decide to wait, the workshop will be available later … but it will be an additional cost (about $100). So you might as well pick it up today. Click the button below to grab your notebooks, Copyblogger Slack invitation, and private workshop! Being creative gives us the opportunity to try out new ideas and a new way of thinking and problem-solving. It helps us acknowledge and celebrate our own uniqueness and diversity. Creativity also encourages self-expression, a way to create something from personal feelings and experiences.